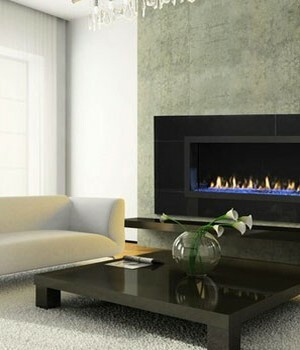 The fireplace is a powerful contemporary focal point of this family room. It features a large-scale stone hearth and a RED (Rectangular European Design) Series fireplace with LED lights, cobalt blue media and absolute black granite refractory and surround. The design is from Heat & Glo, one of the fireplace manufacturers we use when we design fireplaces for commercial and residential spaces.